This morning’s post is part speculation, part history lesson and part printable fun! With the upcoming release of a new historical character from American Girl named Caroline Abbott, everyone is playing the guessing game – what era will our new character be from? Some have guessed the 1950s, some think the early 1900s, and then there are a lot of us who are GUESSING (we DO NOT know) that she will be from the early 1800s – maybe around the time of the War of 1812. Since we are guessing, I thought it would be fun to look at some fashions from the early 1800s and even found some you can print out and color, too. This is Madame Alexander’s tribute to famous French painter Louise Élisabeth Vigée Le Brun – she lived from 1755 until 1842. She was considered the most recognizable female painter of the 1800’s. The high-waisted, also known as empire waist dress that she is wearing in the photo above was very characteristic of the fashions in the early 1800s. Also it was advised that young ladies to wear softer shades of color, such as pinks, periwinkle blue, or lilacs and thin fabrics such as muslin were often used for day dresses. Necklines began to be more square and everyday dresses were not as full. For evening the gowns were much more extravagant being trimmed with lace, ribbons and netting. Sleeves were often short with long gloves and shawls over top. This image is only part of a larger graphic on Victorian fashion – click here to see more dresses and read more about the whole Victorian age. You can always save the image off your computer and print it out to color. 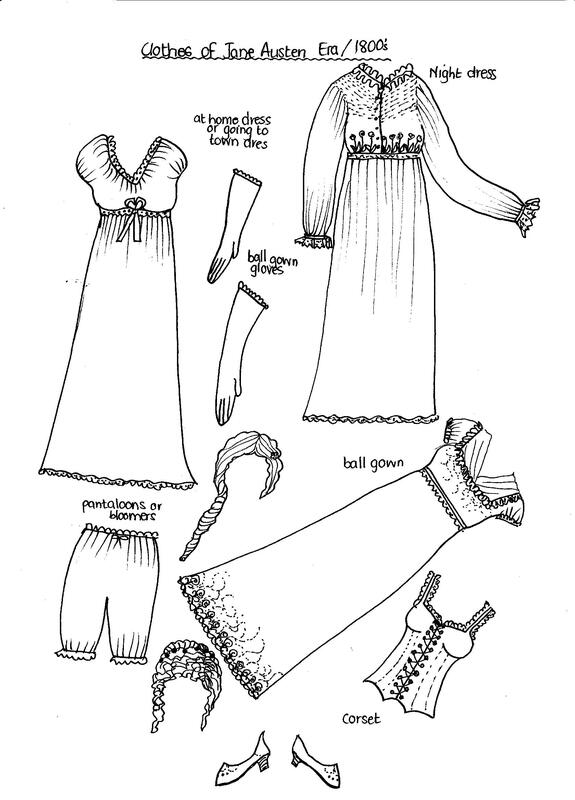 The Graphics Fairy has a really neat coloring page of Regency Fashions (which is what the period form 1795-1820 is often referred to as). Jane Austen was an English writer who lived from 1775 until 1817. Practical Pages has paper dolls from a variety of eras, and I thought this Jane Austen set fit right in with our speculation on Caroline Abbott and what she “might” wear. Click on the image above to get to the full size version to print and color. I can get completely lost in Liana’s Paper Doll blog! She has got some of the most captivating designs for every era in history. Take a look at her 1800s paper doll dresses. She has some that are black and white and suitable for printing that you can then color on your own. So, based on the silhouette of Caroline in the book cover above plus the fashion history lesson you just got, what do you think? Do you think Caroline will be from the early 1800’s? Either way, whether Caroline is from the early 1800’s or not, it really is a lot of fun to learn about history through fashion! It would be cool if she was Irish and she was from the great Irish famine and came to Ellis island so they can start a new life. These are so cool Char! You should do more stuff like this more often! Love it! I still say early 1800s. Looks very similar to Jane Austen type clothes. I know this is random, but I just wanted to say that there is a sale on americangirl.com for limited items up to 50% off! Thank you Emma!! I will keep my eyes open for more opportunities to share history, fashion, fun and dolls all in one post for you! That is so cool! I love Jane Austin’s books! OK, I know this isn’t much to go on but I’ve found that all but one of the Historical Characters ends with the number 4, 1764, 1824, 1864, 1914, 1934, 1934, and 1974. So more than likely her year will end in 4 though Cecile and Marie-Grace end in 3. Belle – yes, I found that earlier this spring. I think Caroline’s stories will be interesting! cool!! and i CAN NOT wait until caroline comes out!!!!!!!!!!!!!!!!!!!!!!!!!!!!!! Cool! I’m around 80% of her having curly hair. Just look at the figure on the craft book! I am sticking with 1800 they don’t have a doll around that time do they? About the name being popular in the 1880s: that’s when they started keeping track, so we have no idea how popular it was before that. All the girls years ending in 4: yeah, but only on the book covers. Kit is really 1932-1934 (which is specified in the looking back), Molly is 1943-45 (summer book mention D-day as a recent event. D-day was in 1944), and Julie is in 1975-76 (76 being the Bicentenial & Ford-Carter election). And obviously C & MG. I love Liana’s blog. Stumbled upon it looking for something comepetly different, spent two hours staring at her lovely art. Makes the paperdoll I’ve made look like doodles. Also this year is the bicentennial of the war of 1812, so the 1800’s would make a lot of sense. Here’s part of the prediction I gave on my blog: “Based on the other books Kathleen Ernst has written, I’m guessing that she’ll be a Scottish girl living in either North or South Caroline, Virginia or West Virginia, or possibly Pennsylvania. She’ll be a girl who holds true to her Scottish heritage while learning about the newly independent United States, so the books will be set around the early 1780’s.” I image that the early 1800s would be a great time period, espeically since there are so many Jane Austin fans; Caroline would appeal to a large group of consumers. I’m so excited for her to be released and I can’t wait to find out what era she’s from! Char, when ru going to have an extra giveaway? And when will the rp contest for june start? Chloe – I am not sure when the next giveaway will start. And the June Reader Photo event will probably be around the 8th or so. Who votes for the titanic?? Thank you for sharing. I am a big fan of the Jane Austin time period. Does anyone know what type of flowers are in the basket or what is there style of basket that the flowers are in? I thought it might be a clue. The basket style is just that way because it’s easier to make out of paper, I believe. No clue what the flowers are. I can almost 100% guarentee you it won’t be Titanic. How cool! I love fashion and history so this was great! I’m sorry, but who’s Jane Austin? ^She’s a popular author from that era (early 1800). I don’t see why AG has that 30 year time gap between Molly and Julie. I do know that Caroline is pprobably from the 1800’s but I hope not. Anyway thanks char for doing this interesting post! Heather- The Titanic would be cool, and it would make sense…but i highly dough it. She will probably not be from the war of 1812 because it is not a major part of historyblike the rest of the AG girls. Since Caroline is a very popular Mae during the American pioneer era I am speculating that she will be from the Oregon trail. ^There’s a 60 year gap between Felicity and Josefina, and another 40 between Addy and Samantha. “a major part of history” I beg to differ. That’s the war where the US proved they were good enough to be a country, and made Britain leave us alone. It sure is fun to learn history in any way! It is the 200th anniversary of the War of 1812, so I think that time period makes sense! Either way, it is fun to speculate! The flowers in the craft basket look like daisies and maybe delphinium – there’s even a type of delphinium called “Red Caroline”!